TN has been Launched and underway! Things are really starting to come together for our official second chapter down in Chattanooga. 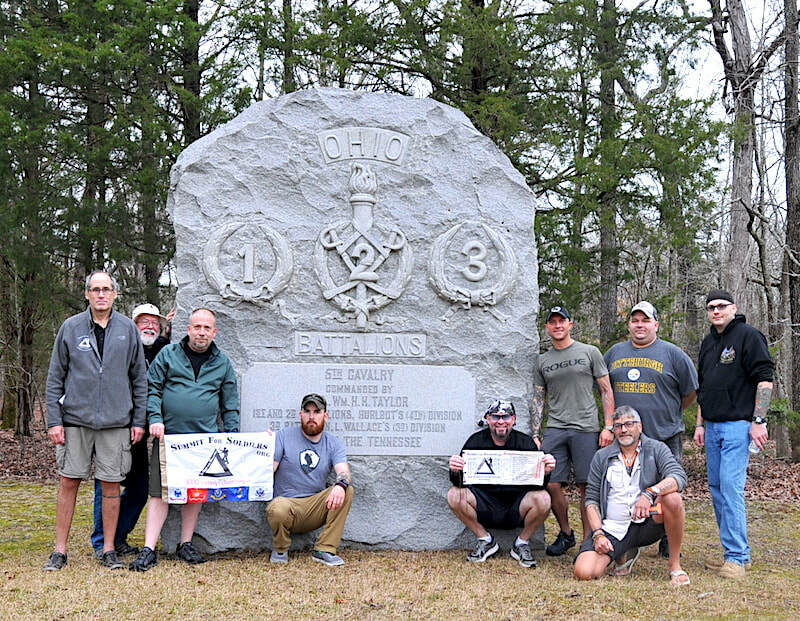 2019 Appalachian Trail Endeavor: Two Weeks ago we launched Paul and Tim on their quest to complete their through hikes of the AT. Both are doing great and showing us just how two motivated "Re-abled" warriors can reclaim their lives! 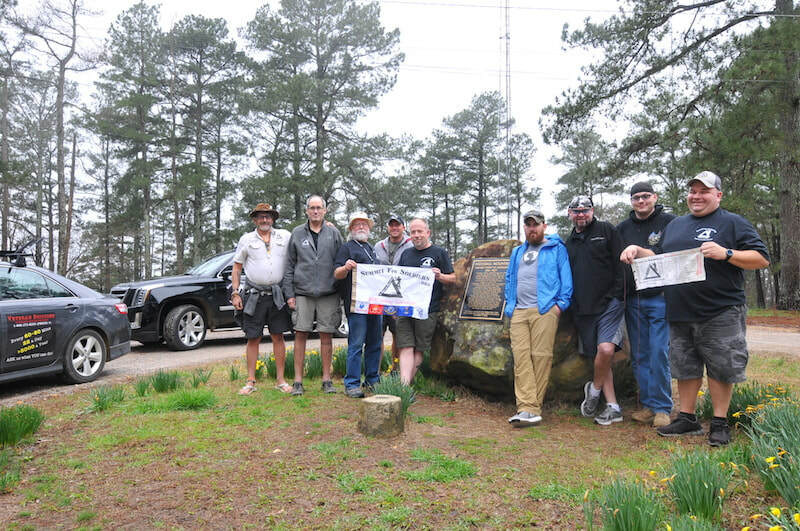 If you can't join us for one of our official high-point outings, then just Download a copy of our flag below and head out to your State High-point. There is one stipulation... you have to take a Service-Member/Veteran or one of their Family-Members along with you. Make it a Group! This mission and message is about solidarity and standing together when it comes to preventing Veteran Suicides (or all Suicides for that matter), and renewing our lives through the therapy of the outdoors! Download and Print the Flag. ​8000 Reasons & 1 Mission!" Over 3000 miles, through 11 states and to the top of 7 State High Points and many other destinations! Awesome time for all, the message carried, and many new friends made along the way! Allen, Tim, Mike M. and Nick traveled out east and raised the flag over 6 New England States! Congrats to there success and for carrying on the mission! ​We will a wonderful, "Snowey" time having out during this short but fun winter outing. Thanks to everyone who cam out to participate. Lots more to come! Everyone had an Awesome time on this very windy and cold hike to Virginia's Highest Mountain! We followed the Appalachian Trail for about 5 miles and that may have been enough to plant the bug for longer treks along the AT. These Major Outings are only open to participants that have participated in our monthly outings or volunteering at our community outreach events. Our Newest Program launched in the Columbus, OH area. It is called "BASECAMP" which is a place where spouses, families, and friends of veterans can come together for camaraderie and support, to just relax and hang out, or to learn more about the common struggles and difficulties they face. A 501(c)(3) Organization, all donations are Tax Exempt. 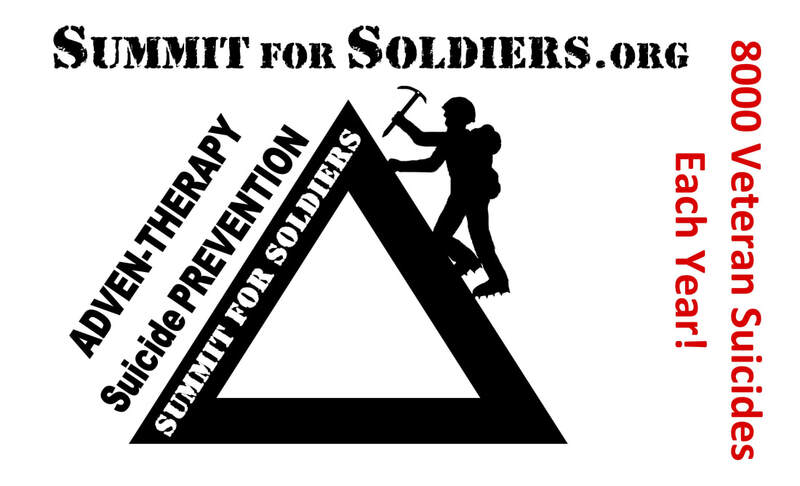 ALL activities at Summit for Soldiers are open to ALL veterans, service-members and families regardless of status or disposition. 1 of 8 Returning Service Members have symptoms of PTS Many more unreported! Active Duty Suicides exceed KIA. Over 8000 Veteran Suicides a Year! STIGMA Kills, so lets "Kill" the STIGMA! MT EVEREST, 19 May 2016: 8000 meters for 8000 Veterans. 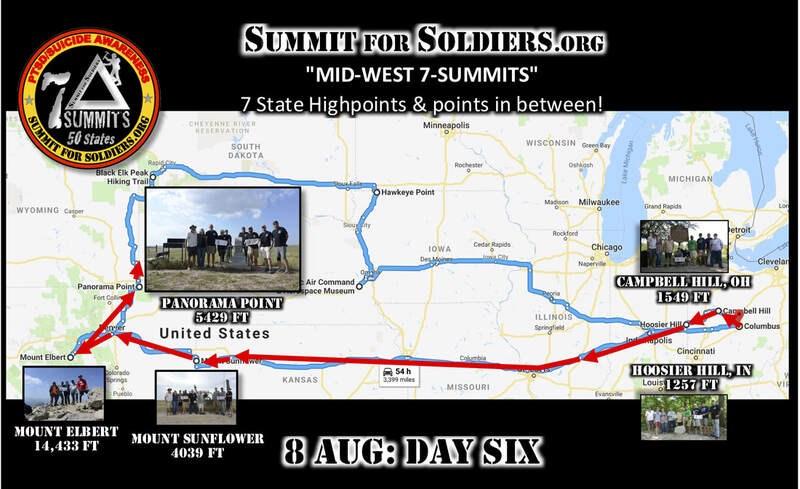 The SfS Bid to reach the top of the 7-Summits and each of the 50-State High-points. Click the Image to visit the Wall. We exist for you. 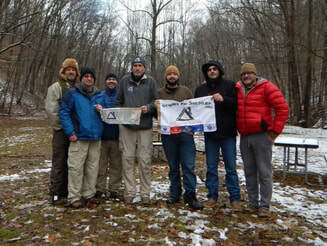 Our Veterans Mountaineering Club was started to serve our veterans and family members. Come join the camaraderie and adventure, it's also a place where folks can just get away and hang out or give each other a hand if we need it. We don't promise answers, but we do promise to walk beside you through it all. ROTC, Recruits, OCS, you are the "Tip of the Spear" of our effort to change the mindset of our future veterans when it comes to the Stigma, early detection/treatment of PTS/mTBI. We have the simple DOD tools you need... if you choose to except the challenge. We can not do anything without the support of our local community. Please come get involved and let us help you, help us to reach out to the many veterans in need. Contact us to find out how to get involved in your neighborhood. Show Your Support and please,"LIKE US" on Facebook!